Dendrochronology seeks to gather information on tree rings, dated to their year of formation, and to use this information to established the age of artefacts (like the timbers of a boat or remains of house) or determine the nature of the climate in times past. 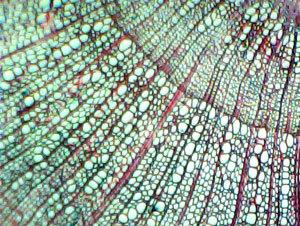 Annual rings form in temperate trees because the xylem vessels or early wood formed in late spring and early summer (when lots of growth occurs) are wider and lighter than those formed in late summer & early autumn, which are narrower and darker (sometimes called the late wood). A light and dark ring together constitute one year’s growth. In winter, there is no growth. The various branches of dendrochronology (dendroarchaeology, dendroclimatology) are based on the uniformitarian principle. This says that the various factors that currently influence tree growth and hence tree ring development will have operated in the past. Through knowledge of these factors (physical and biological) that have influenced current and recent tree ring growth, it is possible when looking at tree ring samples from old wood artefacts / timbers to ‘reconstruct’ the climate of the past. Dendrochronology is also dependent on cross-dating. This involves taking a tree species such as Oak and then measuring the size (width) of the annual rings in a series of differently aged samples, but these samples need to overlap in age. This then enables a profile of tree rings that date back over many hundreds of years to be established. In fact, using living and relic oaks, scientists have developed an “oak ring chronology” for Europe that dates back many thousands of years (the Holocene Period). This oak annual ring time line has been used to date various wooden artefacts with great accuracy – timbers from buildings, boat frames, and furniture. Dendrochronologists have used many wooden artefacts and examined the wood from many different species to build up a picture of when the climate was favourable to tree growth (when the rings would be widely separated from one another), and when conditions were more difficult perhaps due to drought or cold. The period known as the 'dark ages' was characterised by climatic instability, with periods of cold or drought. Professor Baillie ( a tree ring expert from Queens University, Belfast) has suggested that in 540 AD, a meteor exploded in the upper atmosphere. This surrounded the earth with an 'envelope' of dust and ice, which resulted in a drop in global temperature. This may be traced in tree ring samples across Europe, Siberia, North and South America and Scandinavia. The change in climate lead to poor harvests, possibly the outbreak of disease (The Plague of Justinian) and may have heralded the so called 'Dark Ages'. Just as time-lines of growth have been established for certain European trees so the same is true of various North American species. Such studies have allowed scientists to reconstruct the broad patterns of rainfall covering many hundreds of years. Tree ring data from Mexico and other parts of North America indicate that there was a severe drought in the sixteenth century, and that this drought extended from Mexico to the boreal forest, from the Pacific to the Atlantic Coast. The only areas exempt from the drought were coastal regions. This extended drought coincided with two major epidemics of ‘COCOLIZTLI’ (in 1545 & 1576). This was a swift and lethal disease, with a high death rate. It seems to have been a form of haemorrhagic fever, and may have been responsible for the deaths of a large number (millions) of the native population of Mexico. It has been suggested that the virus ‘escaped’ from rodents, when their populations exploded when wet years followed prolonged periods of drought. Data from tree rings support the idea that the drought was occasionally interrupted by wet years – as in 1545. The effects of drought – go on and on.